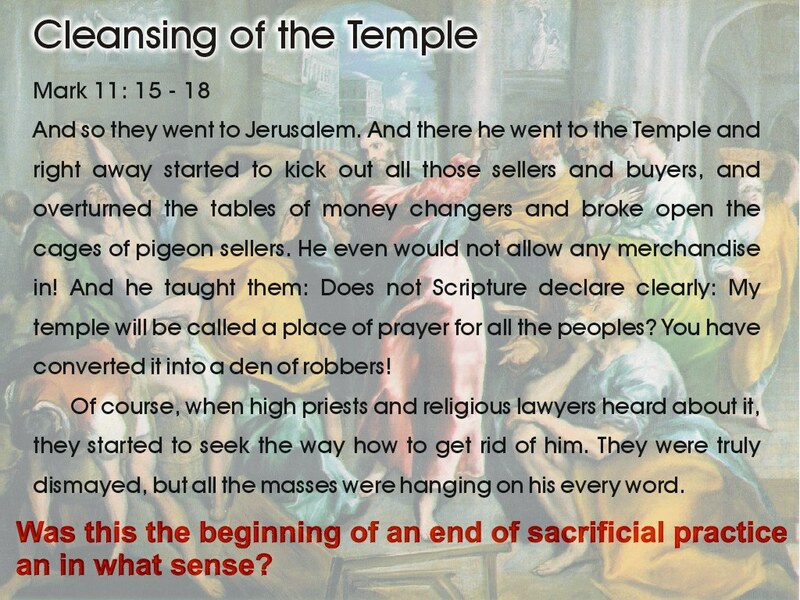 This story from the Gospel of Mark (similar accounts are given in the remaining Synoptic Gospels, and the Gospel of John places this incident at the beginning of Jesus ministry thus giving it even a more prominent role) is often interpreted as the beginning of the end of the temple cult and its sacrifices. It represents what is being called a prophetic action - an often dramatic yet mostly symbolic action with inherent theological meaning. Jesus’ prophetic action of the cleansing of the Temple was clearly aimed at the established religious institution. 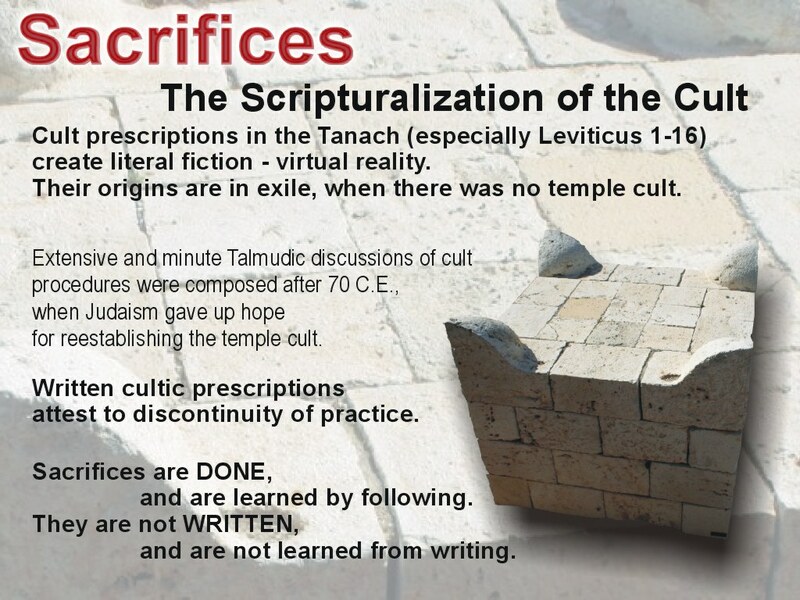 Jesus’ action together with following Christian criticism of the temple sacrifices was in fact a continuation of older theological trends in Judaism. 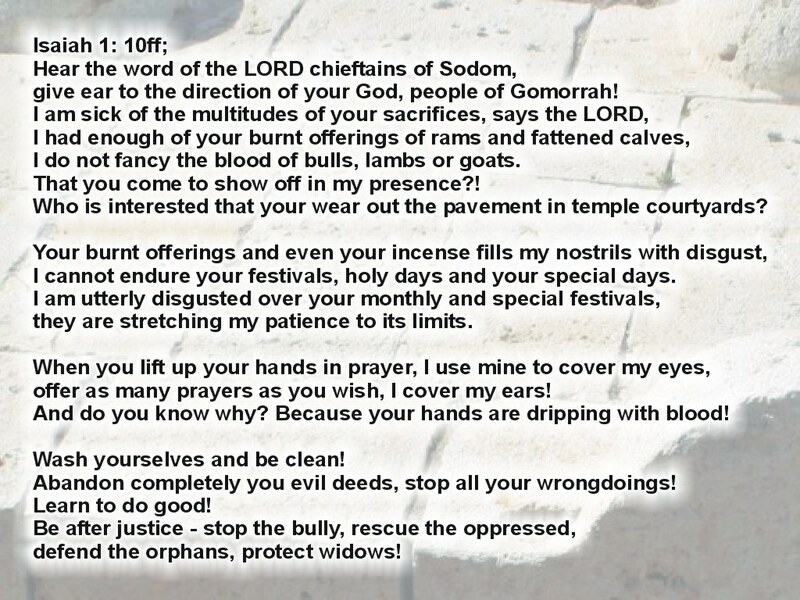 This Old Testament criticism arose from the prophetic criticism of sacrificial rituals which deteriorated into magical practice and were used to mask social injustice. A few examples of this criticism are presented on the following two slides. In order to understand what exactly is being criticized and why, we need to recognize our own distance in time, in mentality, civilization and religion from the original context. 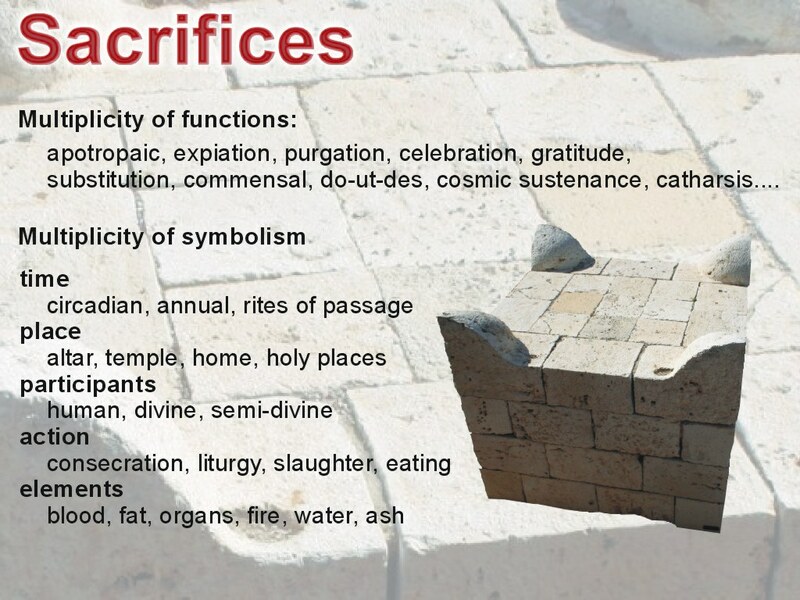 This slide presents a basic selection of different types and kinds of sacrifices as preserved in the Hebrew Bible, one Ancient Near Eastern tradition among many. Sacrificial terminology of other cultures and religions (Syrian, Akkadian, Egyptian) would overlap in most common vocabulary and concepts, but would not be identical. This highly developed and diversified vocabulary is a clear indication of a substantial and complex cultural/religious phenomenon. The time gap and the cultural and mentality differences make it impossible to recreate the original sacrificial system and to fully understand its meanings and nuances. This slide represents a modern attempt to achieve some elemental understanding by applying basic systematization and categorization of this complex system. 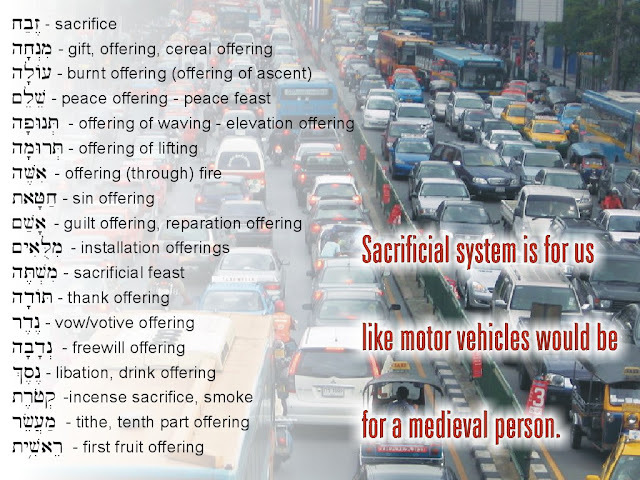 This table attempts to differentiate levels of sacrificial practice while further distinguishing between social/secular and religious functions. The primary function of sacrifices (food and animal) was simply eating together. 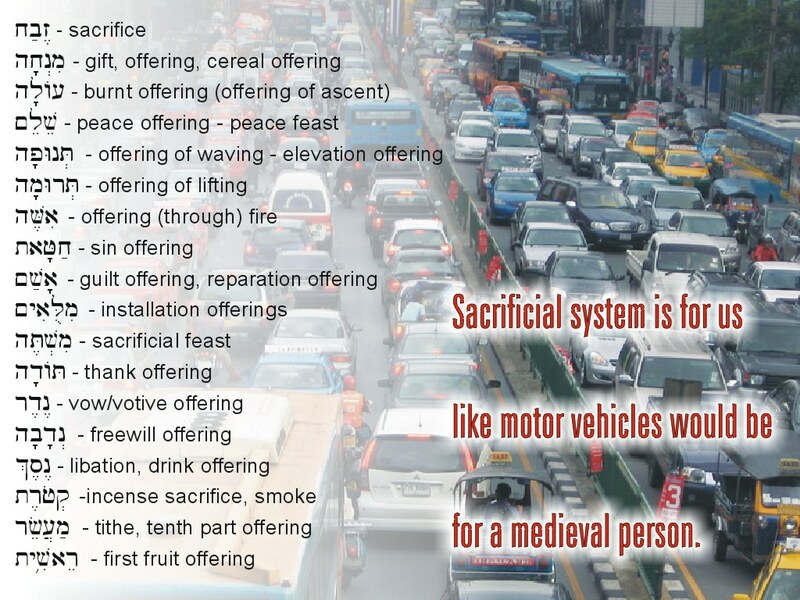 The person or persons bringing the sacrifice, together with invited guests or the sacrificing community ate together. On the religious side, this eating together(commensality) was perceived as extending to the divine realm. The act of sacrificial meal interconnected human and divine participants around one feast. Almost certainly all major communal meals and feasts as well as special holidays and large family meals were perceived as sacrifices, in which divine and human participants participated together. A secondary function of the sacrifices established a more or less equal community around this meal. All members of society participated and were fed. Ritual slaughter of the animals inevitably led to the control of brutality. Individual animal victims were carefully selected and treated individually with prayers and other rituals thus excluding practices known from industrial slaughterhouses. The religious dimension on the other hand help to deal with feelings of guilt from killing this individualized (individually perceived) victim. In a little sinister twist, divinity was made participant and accomplice in this slaughter thus providing further protection from guilt or possible revenge by the animal kin or its divine patron. The terciary or objectionable functions started to developed especially with progressing urbanization in larger communities with larger degree of alienation of individuals. Sacrificial feasts became means for social and political patronage and in the religious realm it had the tendency to deteriorate into the mercantile logic of give and take with assumed divine participants. The dynamic nature of these functions and their diachronic distribution will be a subject of the next slide. This slide and the division of religious development into individual stages (epochs) is at least partly inspired by ideas of the German Egyptologist and anthropologist Jan Assmann. He rejected the simplistic binary enlightenment terminology of polytheism / monotheism and suggested a more intriguing and complex model of religious development. 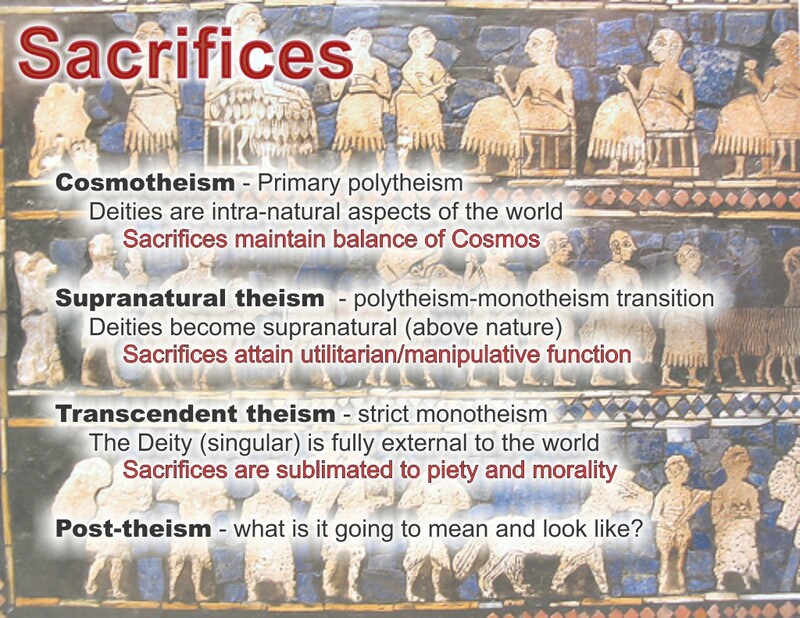 Plurality of gods in polytheism as well as singularity of the divine in monotheism is only the tip of the iceberg. True religious distinction is built upon different concepts of god/s and their relationship to, and functioning in, the world. I wrote more about it in the last paragraph of this lecture about polytheism. This table attempts to divide the development of religion into individual stages, based on how deities were perceived (in relationship to the world) and what impact this kind of religion had on the concept of sacrifices. These stages have never existed in pure form; individual stages overlap even within one culture and society. Current western religiosity is fast moving towards the post-theistic religiosity which I would characterize as predominantly panentheistic and ecologically centered. Yet at the same time in one city even on the same street you can find a new-paradigm-seeking protestant church, a mosque representing transcendental monotheism par excellence (If you want to see a pure monotheism, Sunni Islam is a good example), and supranatural voodoo/santeria religiosity (clear example of polytheistic-monotheistic continuum and blood sacrifices with magical overtones). 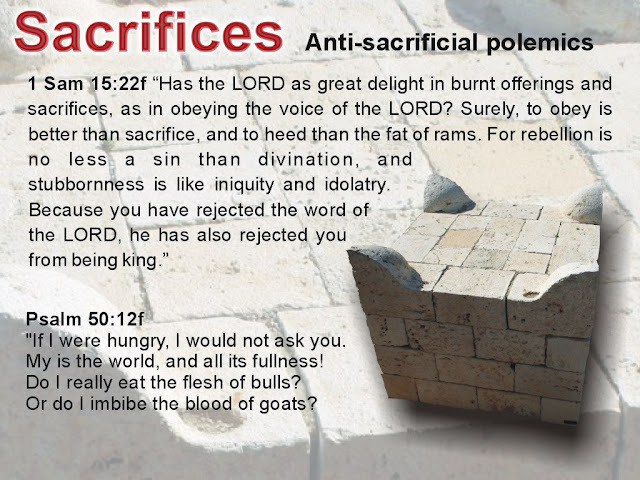 The textual fixation of sacrifices, written instructions and detailed prescriptions for sacrifices are a sign of the disappearing and dying out of sacrificial cult. 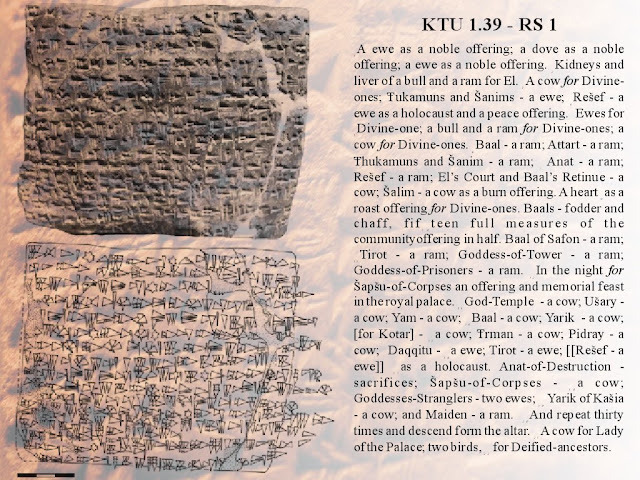 Sacrificial lists like this one cuneiform text from the Ugaritic KTU 1.39 are certainly well preserved and documented from the entire Ancient Near East from the period of healthy sacrificial life, but their form and structure is clearly different from instructions in Leviticus or the minute and detail rabbinical discussions in the Talmud. And even these Ancient Near Eastern sacrificial lists might be the very first sign of subsiding sacrificial practice, when written records have to be used to help remember the exact order and extent of sacrifices. 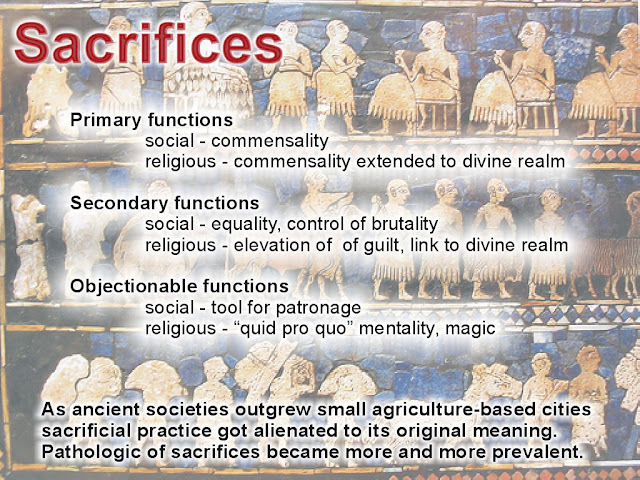 I would like to propose that Jesus’s prophetic action against the Temple Sacrificial Cult was just part of a larger anthropological development criticizing the supranatural understanding of sacrifices and their eventual sublimation to charity, morality and piety. It is likely that this trend still continues. As transcendent theism slowly develops into posttheistic panentheism some form of sacrificial ritual or system rituals might be developing which would recognize again human interconnectedness with the social and natural environment. And finally, we cannot speak about the New Testament and sacrifices without dealing with the so-called doctrine of Substitutionary Atonement. This doctrine came into existence in the high medieval era. It clearly represents theological and anthropological regress towards the concepts of Sunpranatural theism (do ut des). It perverts supranatural theism even further, making God into an impersonal executor of justice who has to demand punishment and who behaves as an authoritative and abusive parent. 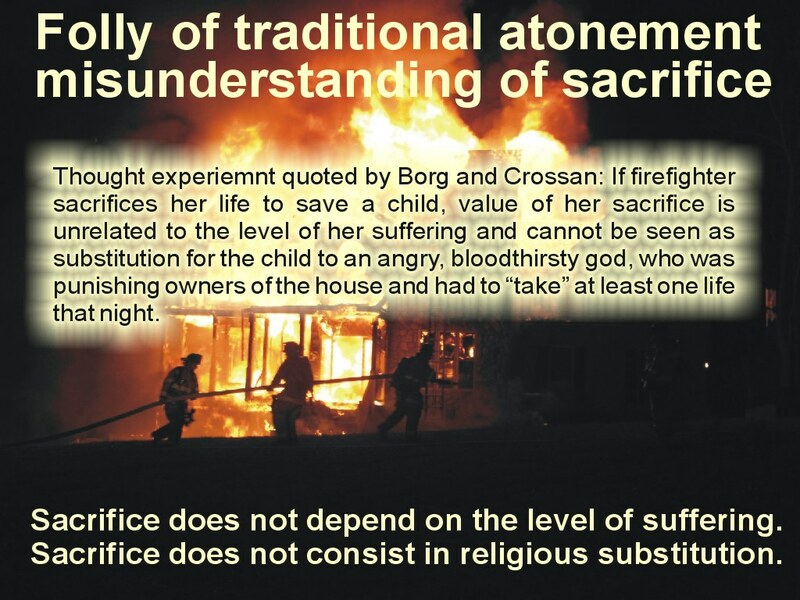 And from the perspective of sacrifices (our current topic) this doctrine also completely misses the true ancient nature of sacrifice. Even an expiation dimension of the blood sacrifice did not consist in the act of killing, but in the community-building feast which it enabled. As John Dominic Crossan says, doctrine of the Substitutionary Atonement represents one of the clearest examples of the "Crime against divinity." For me it also represents dismal perversion and utter misunderstanding of the meaning of sacrifices. In March 1980 a construction company was building an apartment house in Jerusalem. They accidentally uncovered yet another burial cave - a Hellenistic tomb. Archaeologists were called in and they conducted the obligatory rescue excavation. They didn’t find anything out of the ordinary and thus the report was published only several years later (1994 and 1996). It took another decade before journalists and media took notice. A few years ago, around Easter time this quarter-century-old archaeological discovery suddenly became a hot media topic. The tomb became a sensation because it contained ossuaries (stone boxes for bones) inscribed with names known from the gospels. One ossuary even carried the name “Jesus son of Joseph”. In the New Testament times, in times of Jesus from Nazareth, about every eleventh man or boy was named Jesus and every seventh was Joseph, while every fourth or fifth female was Mary. There were thousands of Jesuses! A discovery of a tomb of Jesus is not anything surprising. Even the presence of other biblical names in that cave is not particularly surprising. Jesus was a common name of uncommon hope for deliverance, justice and peace in the midst of despair. Time was ripe for a quantum step of new divine deliverance. Thus finding a tomb of Jesus son of Joseph is not any big surprise. A true surprise would be to find a tomb of the crucified Jesus, or for that matter a burial of any crucified person. But that will open a completely new theme for another article. We plan to talk about it and about the mystery and powerful symbol of empty tombs in our last Lenten Lecture. 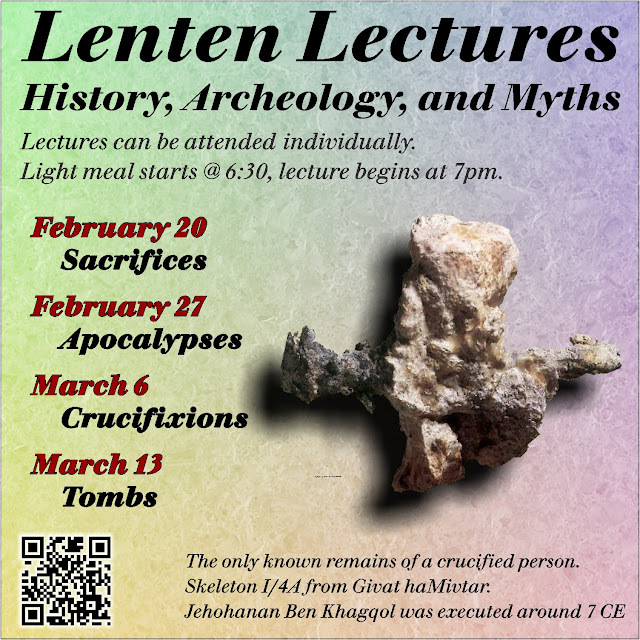 I would like to invite you to all of the lectures. Why am I vegan? Because drinking milk (and eating cheese) is against my religion! Two years ago in Lent I gave up milk. I realized that a large percentage of American milk is produced by injecting animals with artificial growth hormone. The exact number of cows and percentage of milk involved are difficult to find, because every effort is made to keep people in the dark by the moneyed agribusiness monopolies constantly lobbying and fighting against proper and clear labeling. The bovine hormone is genetically designed, industrially produced and given to cows so that they produce substantially more milk. The animals produce more milk alright, but they pay for it with ill health and shorter lives. Every average glass of milk represents unnecessary animal cruelty. And also in consequence, every average glass of milk contains higher levels of hormone IGF-1 (Insulin-like Growth Factor 1) which are known to be harmful to humans (and following two links on this matter, which worked when this message was originally published, don't work any longer because of loooong fingers of agribusiness here they are Cancer Prevention Coalition wwwebpage on this matter and ). For me, this technology of injecting cows with artificial hormones in order to produce more and “richer” milk is a modern version of behavior targeted by a famous biblical taboo. You probably know this taboo in its Jewish transmutation of not mixing milchig and fleishig, milk and meat. The Law of Moses repeats no less than three times (Exo 23:19; 34:26; Deut 14:21) a stern prohibition of cooking a calf/kid in it’s mother’s milk. Originally, theologians thought that this was a religious prohibition guarding against pagan rituals. But not a single trace of any such religious ritual far and near has ever been found(footnote 1). Most likely this cultural taboo had a moral and ethical background, limiting human greed and unnecessary cruelty to animals. In order for ancient farmers to have the richest milk, they had to slaughter the calves. This milk and meat taboo protected against the most natural, yet quite obscene way of cooking it in its mother’s milk. 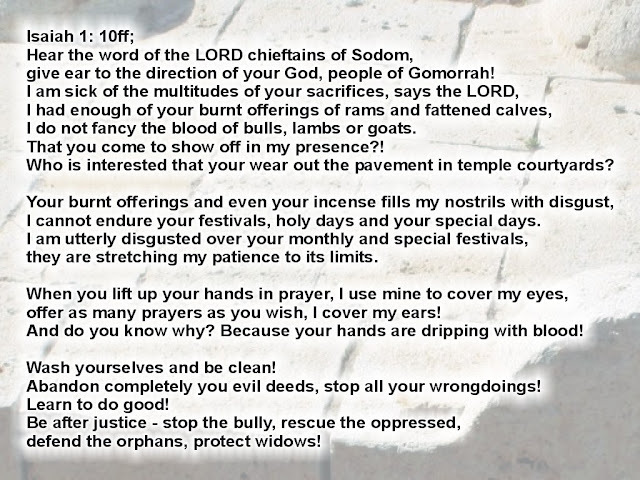 I cannot help myself but thinking that this old biblical rule actually wanted to keep iron age farmers from what we are doing so efficiently and on an industrial scale with artificial growth hormones – satisfying our greed while causing pain to lactating fellow creatures and their young. So I should correct myself; It is not the drinking of milk and the eating of cheese which is against my religion, but causing unnecessary suffering to the vulnerable creatures is! In Lent we try to realign our lives with the divine will for ourselves and for the world. We aspire to mend our relationships with our fellow humans and other creatures and try to live responsively and lightly on Earth. Come this First Sunday in Lent to search together for "Consumerism Detox". (1) After the discovery of Ugaritic Texts, the first translators and interpreters in the 1930s thought they found the reference to this practice (boiling a kid in milk) in the cuneiform texts on the tablet KTU 1.23.14. Nevertheless it was a clear example of wishful translating. They wanted to find this reference and they attempted to bend the translation and interpretation against the linguistic rules. From 1970s onward more sensible translation became widely accepted standard. There are good reasons to translate the text this way, one of the strongest is based in the rules of Semitic poetry which would not allow parallelism kid || mint, while coriander || mint makes better sense. 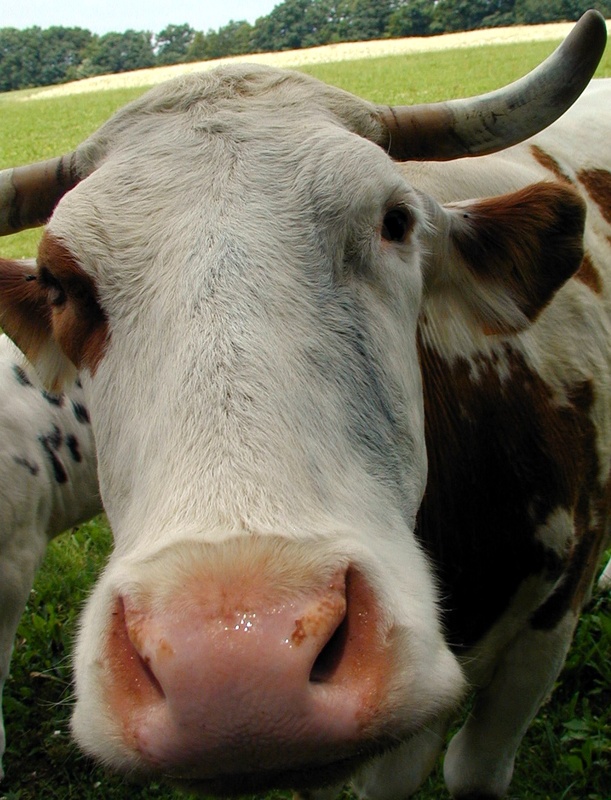 If you have ever looked closely into eyes of a cow, you understand what I mean. “You are trespassing! Give me your names and addresses!” A zealous county official barked at us, waking me up from my life-long dream. We were exhausted, returning from many miles of a harsh hike across uncharted and unmapped terrain. Exhausted but happy, earlier that afternoon I had fulfilled my childhood dream. Lava flows near the border of Hawai'i Volcanoes National Park and Kalapana Gardens Subdivision. 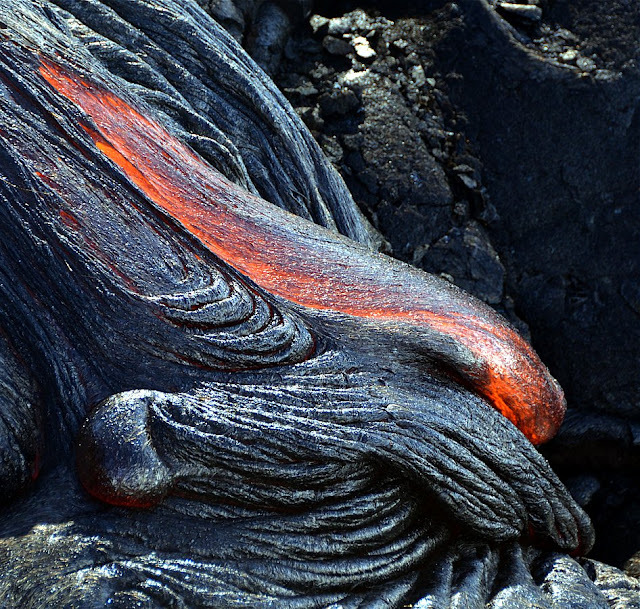 We got into touching distance with red-hot flowing lava. For me it was a life-changing experience, I felt the deep heat permeating my entire body down to every bone; we saw the slow oozing movement of dark glowing honey-like rock. We observed the newest layers of our planet being born. 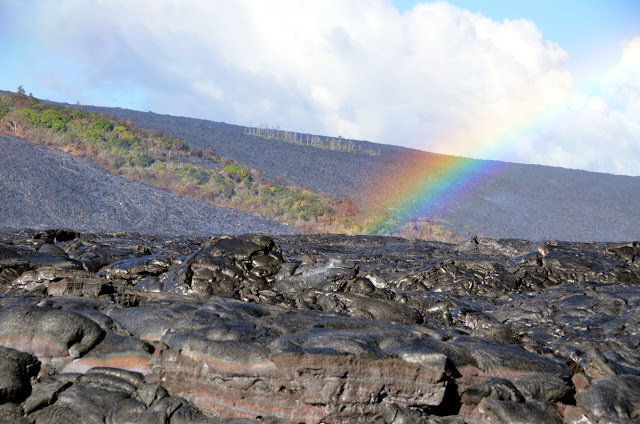 On our way back, a short shower stretched up a full arc of rainbow above the barren lava fields watering the first fern seedlings in older cracks. Rainbow over the lava fields beneath pali (steep slope) with few kipukas (remaining islands of vegetation). From my personal experience I know why theory of Evolution came into being on volcanic islands. They inspire awe, curiosity and imagination. “You are trespassing, The fine is five hundred bucks each.” The American reality was not going away. But it could hardly be any more surreal. What trespassing? We spent a full day hiking across barren undeveloped lava fields. If there used to be any private claims, they were buried under layers upon layers of new featureless lava rock. What trespassing? Some of the land wasn’t there just days ago, even according to my GPS and cellphone Google maps we walked on sea. The oldest lava was about two decades old. What trespassing in the land which has just been born? Of course the land belongs to God! Don’t worry, I did not argue metaphysics with a person in the uniform. Instead I used my best respectful tone remembering my mother’s advice about officers; “Yes officer, no officer, so sorry officer, never again officer ...”, apologetic, respectful. It paid off, we were let go, forgiven the hefty fine. But even this unpleasant absurd encounter became part of our unforgettable transformative experience. It formed a dual experience carved in my memory; an awe of a red-hot flowing rock forming new land in front of our eyes and under the rainbow arch, and the utterly absurd individualistic, idolatrous(!) ownership of land and life. 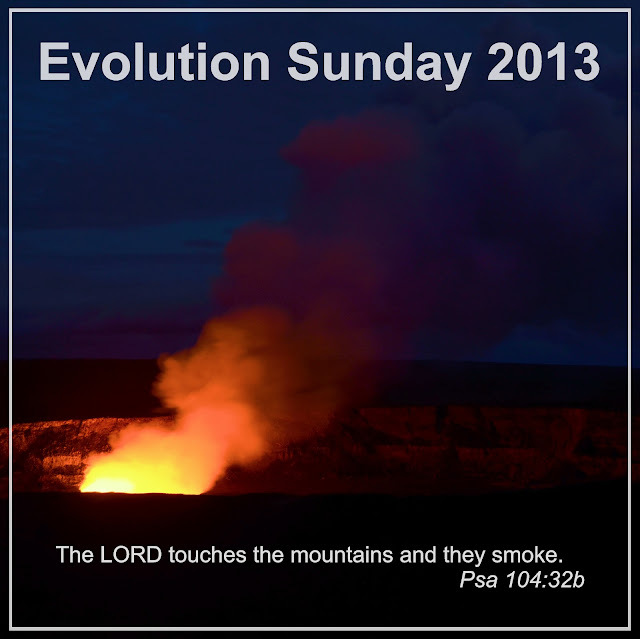 This Sunday we celebrate Evolution Sunday. Charles Darwin’s Theory of Evolution will open our eyes to miracles of nature. Biblical hymns of Creation will help us question the idolatry of ownership and possession. Darwin and Bible, science and Faith, they can complement and enrich each other. An evening view of Kilauea Caldera with Halema'uma'u Crater and fumes rising from a lava lake. Jesus was a holistic doctor with some bitter pills. Radically holistic. Normal medicine treats a single illness, malady, or disease. Holistic medicine treats illness by treating the whole person, mind and body, diet, lifestyle, behavior, and perhaps the family context. Jesus was radically holistic; he did not stop with a single person. He treated illness within the context of the broader society. Here are two modern illustrations - one medical and one non-medical. When my wife Martina started to practice medicine in Binghamton NY, almost every week (either on Monday or Thursday) she joined a small group of volunteers at the local free clinic. They served uninsured working poor. “Commercial” doctors were not happy. They accused them of giving medical care for free! One Thursday evening a waitress in a local popular restaurant came, a single mum of two, desperate to keep her job. She was diagnosed with a large paratonsillar abscess (it can be deadly if untreated - it killed George Washington for instance). For several days she had been waiting on tables with fever, spreading germs among the local upper crust. Is it better to treat promptly one uninsured for free than later dozens of well-heeled hungry throats? In December I visited Mary Birchard in her home. On the wall in her living room she keeps an interesting artefact form her Philadelphia childhood home. It is an age-old sign which was to indicate, that fire insurance was properly paid. In the case of fire, the brigade would arrive, but they would fight the flames only if they found this sign. Even among the most independently minded individualists, suspicious of government and taxation, as many are on this side of Atlantic, people eventually realized that this arrangement did not work especially in densely populated cities. Thankfully, we have public fire departments almost everywhere now. These are two examples as to why a broadly holistic way of treating illness and fighting fires make perfect sense. But where are those bitter pills? In the gospel of Luke (4:24-30) Jesus prescribed them immediately in his first sermon. He told his audience, get over your spiritual selfishness. I am going to treat you unlike any other doctor or preacher or prophet or healer before. I am going to treat you by treating and welcoming and helping not you, but people around you, neighbors, strangers, and even those whom you despise. In his first sermon Jesus outlined this program and made people so mad that they almost killed him, wanting to throw him off the cliff. Thankfully they did not succeed, and the holistic treatment could continue and continues until now! Sometimes we simply need to take this kind of bitter pill; sometimes we simply need to hear that our own healing comes through the healing of others and the healing of the entire society. Sometimes we simply need to give up our natural selfish desire to get better individually, in order to get truly better together. Sometimes we simply need to accept that God wants to embrace us by loving our difficult neighbors or even enemies. Without this love, we could hardly get better. These are the holistic bitter pills of the sweetest hope. And for those who read as far as here: The text in the gospel contains clear signs that this was not a single original sermon. It was Luke's creation, a collage of pronouncements and teachings which were to characterize Jesus' style and attitude. In Gospel it is presented as Jesus' first sermon, while in fact it offers us even more, an insight into how Luke (or his community of faith) understood the essence of Jesus' preaching and early ministry.